What is included in a full graphics kit? Complete semi custom Fresh Moto graphic kits include radiator shrouds, air box, number plates, front and rear fender, fork guards, swingarms, and Fresh Moto fender arch decals. We’ll even throw in a few mini plates at no extra cost to you. If your bike doesn’t have fork guards, no graphics for the fork guards will be sent. What material do you guys use? Your graphics are ALWAYS printed on our high quality MX Thick Fresh Moto material. What logos can I get on my bike? Customize your kit by filling in your choice of logos. We have hundreds of motocross related logos however, if you want a logo we don’t have, we can create a generic one to fit the design of your graphic kit. If you have a personal or company logo you’d like on your kit, please email it to us directly at orders@freshmoto.com in a vector (.ai, .eps, .pdf) format. If you don’t have your company logo in a vector format, email us for custom logo design and pricing. Please include your order number in all emails. Can I see the graphics before they are printed? Yes, we’ll send you a proof with up to 3 revisions. You can then send us any changes or corrections within reason. We will not send you a completely different design because you have simply changed your mind or you “want to see what it would look like if…”. We want you to be completely satisfied with how your graphics turn out but it does take a lot of time to make these changes. If you would like to purchase a complete custom kit, we would be more than happy to help you make your graphics completely custom. Custom design adds $75 to the cost of the kit and we’ll send you up to 5 revisions. I had a custom kit designed, now I just want the same kit reprinted. Do I need to pay the custom design fee again? No, your custom design fee is a onetime thing. Once we have all the details dialed in we can reprint without any additional design time or fee. When will my graphics ship? Graphic kits will ship within 5 to 7 business days, but usually sooner, if no proof is ordered. If you would like to see a proof of your graphic kit before its printed, we’ll be able to send it to you via email within 2 or 3 days of your order. Proof revisions will also be sent within 2 to 3 business days. Once the kit has been approved, we will print and ship your order within a few business days, but max 5-7 business days. We ship almost everything UPS ground. We have found, over the years, that this seems to be the most reliable and dependable way for us to ship. If you request to have your order shipped to a PO Box we will ship USPS priority mail. How long does it take to print my graphics? We try to keep a very fast turnaround time however there are certain delays which are inherent to custom products such as: Incorrect information or details, improper billing information, use of non-industry logos and or custom logos. Usually it takes only couple days for products to leave the facility and often we ship products the same day they were ordered. Do you have install instructions? Yes, please read these suggestions carefully and take your time installing your new graphics. Can you install my graphics on the plastics? Yes, we would be happy to install your new graphics for you. You can send us your clean plastics, drop ship new ones directly to us, or we can order new plastics for you. We’ll install your graphics for free. If we need to remove any dirt, adhesive and/or old graphics from your plastics there will be a $20 fee per panel. I got my graphics and the colors look different than they did on my computer? We have made every effort to display accurate colors of our products on your proof. However, the actual colors you see on your computer will depend on your monitor and its settings, we cannot guarantee that your monitor is set up to display accurate colors. My bike plastics may not be the same year as my bike, how do I order graphics? Certain year plastics can fit on different year bikes. Just let us know what pieces you have where (at the time you place your order). For example in the notes section of your order you can write: My 2008 KTM has a 2015 front fender plastic. If you are unsure you can send us pictures of your bike and we will do our best to figure out what you have. Please let us know if you have baja designs, cycra plastics, or UFO restyle kit. Please note: Your kit design may differ slightly depending on model and year. I looped out, Can I order just piece for my kit? Yes, we can send you replacement pieces for you kit. 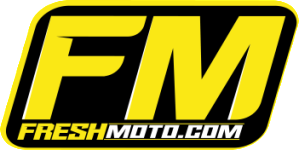 Email us at orders@freshmoto.com with your name, year, make and model of your bike and which piece(s) you need. Can I return my graphics? All orders are to be considered final due to the custom nature of our products. I got my graphics and they do not fit. What do I do? If your graphics do not fit please call or email us right away and if there are fitment issues please take pictures and email them to us. We will investigate and if we find that we used the wrong template we will send you replacement graphics at no charge. If you have selected the wrong model or year, then you are held responsible for the reprint of your order. I got my decals and the name is misspelled or it’s the wrong number or color. What do I do? Please call us right away and we will investigate the problem, if we did something wrong we will fix it at no charge.